1. Nice and Mean is the story of two girls who don't like each other yet have to work together on a project. Did you ever have to work with someone you didn't like-and how did you handle it? JL: Strange to say, I can’t remember getting stuck with any really awful partners. (It’s possible that I’ve blocked them out but channeled them into my poor characters’ lives.) I do remember prepping a presentation for history class, though, in which I worked with two good friends and one so-so friend, and it did not go entirely smoothly. The good friends and I would say, “Oh, we’ll do this and this,” and the so-so friend would say, “And I’ll do the map.” And when we made plans to work on it at someone’s house, we said, “We can run through the presentation,” and so-so gal would say, “And I’ll work on the map.” You can see where this is headed. Sure enough, when we actually got together, my good friends and I were sprawled around the bedroom, eating hummus and crackers and outlining what we’d say, and the so-so friend was just crouched over a map, carefully tracing. The map wasn’t that big a part of the project; we all needed to plan our parts; and this girl wasn’t even paying attention! Finally I said, “Hey, So-So, can you help us with the presentation?” To our immense gratitude, she reluctantly parted with her mechanical pencil. Even though it was just a small moment of asserting myself, and with someone I wasn’t particularly intimidated by, I felt proud that I’d asked for what I wanted, instead of just fuming and rolling my eyes. That’s the kind of thing I hope people might gain the confidence to do after reading Nice and Mean. 2. 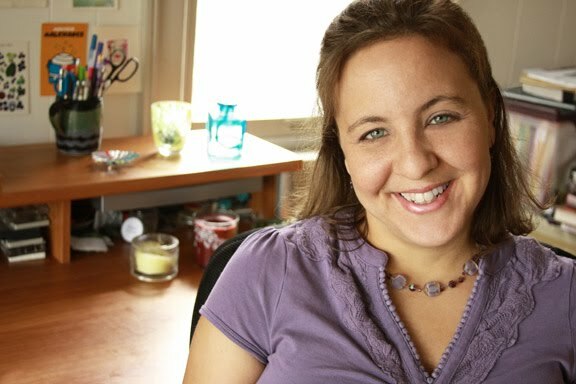 If you weren't an author, what would you career be? JL: I’d go back to my previous profession, teaching middle-school English. Reading, writing, dressing up; celebrating projects with pints of icing (yes, icing.) What’s not to love? 3. If you were stuck on a desert island, which five books would you take with you? The Secret History, by Donna Tartt. Ulysses by James Joyce…so maybe I’d finally finish it. 4. What mean girl (real or fictional) would you hate to be partnered with? JL: The current iteration of Jenny Humphrey on Gossip Girl. She’s pretty conniving, but she’s not as clever as Blair, so I’d really have a hard time with her. Plus, I’d get in trouble for cutting her hair. There’s such a thing as too much long platinum blondness. 5. What's your favorite thing about the library or favorite library memory? JL: From kindergarten through sixth grade, library class was part of our weekly schedule. In sixth grade, it came right before lunch. The school I went to in New York City had thirteen floors, with the library in the lobby and the lunchroom in the basement. This small detail was responsible for a real gaffe that befell a friend I’ll call Quin. Fortunately, it was the kind of school where you didn’t get in trouble for things like that. Mostly, we laughed. I still think it’s hilarious that even though we had library fourth period on Wednesdays every single week, for some reason on that particular Wednesday, that piece of information just slipped Quin’s mind. I know that story doesn’t really highlight what’s awesome about libraries, but I’ve actually written about that a bunch this year, thanks to Jenn Hubbard’s Library-Lovin’ Blog Challenge and Shelli Johannes-Wells’s Library Appreciation Day. To read those stories, head here. Thanks for having me, GreenBeanTeenQueen! I love librarians who care about finding new books for their readers, and I’m honored to be featured alongside them! Jessica is hosting a giveaway in honor of Nice and Mean's release! Leave a comment below telling me if you're nice or mean and you have a chance to win something from Jessica's Nice and Mean Loot Box! Ages 13+, US Address, and contest will end at midnight June 13-so start commenting!! 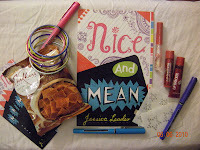 You also have a chance to win more at Jessica's blog! Don’t forget to head over to Jessica Leader’s blog to enter the Nice and Mean Grand Prize Giveaway—aka, all this swag plus a copy of the book. Learn how to earn points by spreading the word, or win the battle of wits,where you get others to vote for your favorite nice or mean character in books, tv and movies. Want more of the tour? Check out The Story Siren and The Page Flipper! Definitely nice...but probably not as nice as I should be. Maybe a bit of both, in diff situations! Hmm... am I nice or mean? Well, I think that no one can be only nice or only mean because situations call for different actions. I try to be nice and usually am, but ask my sister and she'll say otherwise. It just depends, but I'm nice (well, I hope). Definitely a mixture of both! Can anyone be entirely nice or mean all the time? Thanks for visiting, everyone! I agree that everyone is a combo of both--even the people with the reputation for being one or the other. Thanks for hosting, GBTQ! Hmmm...I'd say nice..sometimes too nice :) Sadly the word doormat is not foreign to me :( Great contest enter me please! I am nice. I have been told that my core is goodness and love (by a friend who claimed that his core was selfishness and fear - yikes!). That is not to say that I have never been mean of course! Great interview. I am a tween, so these books have sure got my attention. Nice or mean? NICE for sure! I am most definitely nice! Oh dear. I'm mean. I eat Skittles instead of spinach, I put off giving my dog a bath for as long as I possibly can (doesn't the rain work just as well?) and I have the habit of watching bad TV when I should be... studying... or something. Definitely bad. Thanks for the contest! I am toooooo nice. It leads people to take advantage of my good nature - which the tends to make me unkind. I'm nice and mean, it depends to the situation and person. Jenny Humphrey is certainly very mean but I feel Blair is meaner! I am usually nice but have to be mean sometimes if the situation so demands! Some people so dont understand 'nice'! I try to be nice, sometimes not enough! I'm a teenager—I flop back and forth by the minute! At the moment I feel rather nice. Well that's a hard question. When you first meet me i suppose i may seem a bit mean or uncaring. This is a result of my extream shyness and my not being able to have lasting conversations with people i've known 5 minutes. But when you get to know me you realise i'm nice. Though i like to carry that out in a semi-secret way as to not bring attention to myself. So i guess i'm both?